The Mini Cooper isn’t for everyone, but it’s not supposed to be. If you can deal with the cutesy-retro looks and the relatively small size, you’re in for one of the most fun and surprisingly practical motoring experiences around. 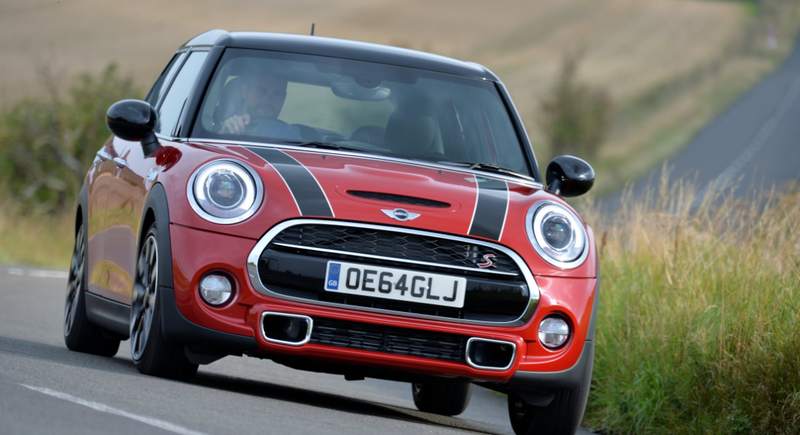 What do you need to know before you buy a Mini Cooper? Don’t worry, we’ll tell you everything right here in the Ultimate Buyer’s Guide. BMW has been cranking out Minis since 2001 now, but the latest Cooper — completely redesigned for the 2014 model year — is the most BMW-y one yet. It rides on a new platform that will underpin several BMW and Mini models, and it uses all-BMW turbocharged engines for the first time. More than ever, it feels like a small, front-wheel driver Bimmer inside and out. The downside is that it’s bigger than any of its Mini predecessors, and while it has an extensive array of options and customizability, it can get quite a bit more expensive than many of its hatchback competitors. Our testers have given the new Cooper and Cooper S high marks for a vastly more refined interior than its predecessors, a more balanced better ride, punchy turbo power and tons of grip on the road. While Mini’s claim of “go kart-like” handling is a bit ridiculous, we can’t deny that the Cooper and Cooper S are a ton of fun to drive at any trim level. In S trim the Mini Cooper manages to make good use of the extra power and a suspension tuned towards performance to keep it nicely planted in the turns when taking on backroads, but it’s a bit too subtle for our taste. If subtle isn’t your style, we found the JCW Mini Cooper to be appropriately loud, although not the best handling car in its class and a little on the pricey side. Surprisingly, the most fun Mini Cooper is probably the cheapest. With its simple three-cylinder turbo engine and a six-speed manual its light and straightforward and a bit more of the manic Cooper we’ve loved in the past. An all-new 2-door hardtop Cooper joined us for the 2014 model year. Built on a completely different, larger platform, the new Cooper offers more interior space, revised styling, better interior quality, a nicer ride, and better fuel economy than the outgoing model. So, its a pretty big step forward. Except that it got bigger – par for the course for new cars but a bit odd for a car called a Mini. The following year, 2015, brought a John Cooper Works trim level to the 2-door, and the 4-door model built on the new platform debuted. Changes for the 2016 model year were insignificant. It just never really feels that quick. This new engine is smooth and punchy, with plenty of low and mid-range torque, but it kind of runs out of steam up top. It feels like it should be faster. It’s never manic in its power delivery the way some hot hatches are . The tuned engine by John Cooper Works puts out nearly 40 more horses, though, so that might be the one to get if you want to maximize driving excitement. But at over 30 grand, that’s a hard pill to swallow. The base car’s little 1.5-liter three cylinder makes only 135 horsepower, but it’s actually pretty fun to wring out, and the handling makes it pretty fun in the corners. All engines come mated to either a 6-speed automatic or a 6-speed manual. That little inline-3 really struts its stuff on the fuel economy front, scoring 39 miles per gallon on the highway on manual models. But even the performance-oriented turbo engines will let you enjoy over 30 MPG on the highway, so no matter what you choose, you don’t have to feel guilty about spending your whole day carving canyon roads. The Mini Cooper can be configured in lots of different ways, but the base trim levels are: Cooper, Cooper S, and John Cooper Works. Front suspension for all Coopers is a MacPherson strut design while the rear is a multi-link setup. All Minis get electric power steering. Cooper: Starts at $20,700 for 2-door and $21,700 for 4-door. Notable standard features: Mini driving modes, dynamic traction control with electronic differential lock, 15” alloy wheels, 4-speaker audio system, rain sensors, auto headlights, leatherette seats, unique chrome grille. Notable options: 6-speed automatic transmission ($1,250); Cold Weather Package: Heated seats, power folding mirrors ($750); Sport Package: Sport seats, Dynamic Damper Control, LED headlights, upgraded wheels, white turn signals ($1,500); Premium Package: Harmon Kardon sound system, panoramic sunroof, automatic AC($1,800); Media Package: enhanced Bluetooth with USB adapter, Visual Boost, Center Armrest with cellphone docking ($750); Wired Package: Center armrest, Navigation system, enhanced Bluetooth, Visual Boost XL, real-time traffic info ($1,750); JCW exterior package: JCW aero kit, spoiler, white turn signals, 17” JCW wheels ($3,250). Cooper S: Starts at $24,100 for the 2-door and $25,100 for the 4-door. Notable standard features over Cooper: 2.0-liter turbo I4, hood scoop, brake ducts, run-flat tires, LED fog lights, 6-speaker audio system, sports seats, 16” alloy wheels, black grille, center exhaust. Notable options: 6-speed automatic transmission ($1,250); Sport automatic transmission ($1,500); JCW exterior package ($2,500); Other options similar to base Cooper. John Cooper Works: 2-door starts at $30,600. No 4-door available. Notable standard features over Cooper S: Tuned 2.0-liter turbo I4, JCW Exterior Package, JCW interior trim, LED headlights, JCW sports seats, unique sport steering wheel, 17” JCW wheels, white turn signals, rear spoiler, unique headliner. Notable options: Options similar to Cooper S (no Sport Package or non-sport auto transmission available). UPDATE: After a member of the Jalopnik staff bought a 2015 Cooper S and did the extensive test driving associated with that, we decided to revamp our suggestions a bit. The three-cylinder base Cooper may not have a ton of power, but it’s a fun engine with a great little growl. We love wringing that motor out. The base Cooper also has a unique fascia that we prefer to the S. And perhaps more important: Thirty Nine Miles Per Gallon! That’s a lot of miles from just one gallon of gasoline. The key there, however, is to get it with a manual gearbox so you can wring it out. With an automatic the three-cylinder engine shows its economy car roots and runs out of breath quickly.